In the summer of 1994, feature film animation experienced a clear historical event with the release and subsequent monsterous success of The Lion King. The uber successful film set the expectations benchmark for all feature animated fare for the next 7 years. Everything was measured by how it ranked against TLK. The bar was set unreasonably high. 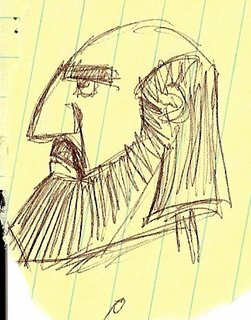 Later that same year Jefferey Katzenberg left Disney with his nose permanently out of joint, which led to the eventual founding of Dreamworks SKG. Also in 1994 Disney released it's first DTV sequel adaptation of a recent feature film hit with Alladin2: Return of Jafar. The "Cheapquel" train left the station that year only to gain speed at an alarming rate. It's not a stretch to say that the landscape of feature animation was forever changed in 1994. Shortly on the tails of 1994, the feature animaton biz experienced another bellweather. November of 1995 we saw the release and subsequent unexpected rave success of Toy Story. Made by some unknown little technology company named Pixar, the CGI animated film was born and a new era was ushered in. Now we sit in January 2006. First Hoodwinked carries forward the Alladin 2: Return of Jafar momentum, only this time in CG. It was only a matter of time before something like Hoodwinked - a very cheaply made film done overseas that does a respectable (and highly profitable) business with the animation buying public- was going to happen. Will Hoodwinked have the same downward pull on the CG feature market that Alladin 2 began in traditional? Time will tell, but the clock is running. Then came the big news that Disney has bought Pixar. This is obviously a play out of the rest of the watershed events of 1994/95. I see Disney buying Pixar as the culmination of what was set in motion back then. What was that Lion King theme song again? Something about the circle of life? Indeed. This wonderful, powerful, moving film debuted at #10 in the US box office this weekend. There's absolutely no mainstream buzz about this movie, but that's to be expected. It's the true story about christian missionaries and their greatest of sacrifices. The central theme is how the power of forgiveness can break timeless cycles of violence. The opening monologue of the film says this. It has been said that we cannot ever find true peace because we have never found a way to change the human heart. The events of this story challenge that. For more about the movie and the real events & people behind it, check out the movie webpage. Funny thing is I worked on some of the FX animation for this film last year and I didn't even know what it was. I was sitting in the theater thinking "Hey, I worked on that shot!". All I knew at the time was that we were working on some movie with a yellow plane and indians in the jungle. If I'd have known what it was about (or even how good it was going to turn to be) I would have been hyping this thing like crazy! Anyhow, skip Hoodwinked this week (please) and go see End of the Spear. You won't be sorry. 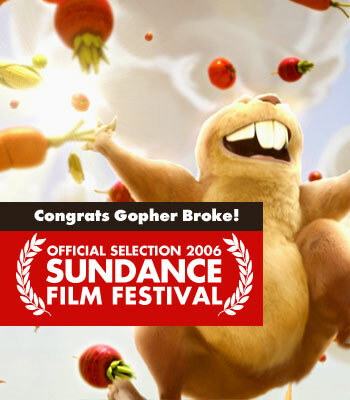 Blur's Academy Award nominated animated short film Gopher Broke is available for online viewing as a part of the Sundance festival. I had the priviledge of helping Jeff Fowler get his story from idea to screen during the initial development of this film. After I left Blur for Texas Jeff took over as director and did a wonderful job making a really funny film. Go enjoy it! I've always loved Post-It-Note drawings. 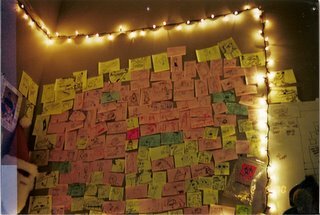 This is a snapshot of the wall over my desk when I worked at Big Idea. 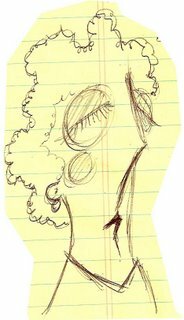 The arrayed collection of doodles was the product of three things. Me & my partner in crime, Bryan Ballinger sitting together. Lots and lots of dull meetings. Bryan and I would sometimes tear through a pad per meeting, often trying to get the other one to break out laughing in the middle of the meeting. That was the ultimate sign of success, to get people to look over the two of us wondering what the heck was so goshdarned funny. Good times. The doodles in this pic represent probably less than 25% of what we pumped out. This was the shrine to the boring meeting doodle. Bryan had a shrine to odd food called the Museum of Regretable Edibles. It had some real doozies. Tuna Jerky for you- and your pet! Cross species food items are always a winner in our book. I'm sure he has pics of it. Anyhow, to give a sense of scale, if I were sitting at my desk working (instead of taking this picture) my head would have barely broken the bottom of the frame. The pad doodle ran about 10 feet up the wall. It was a tall ceiling. Anyhow, I thought some folks might get a kick out of this bit of nostalgia. 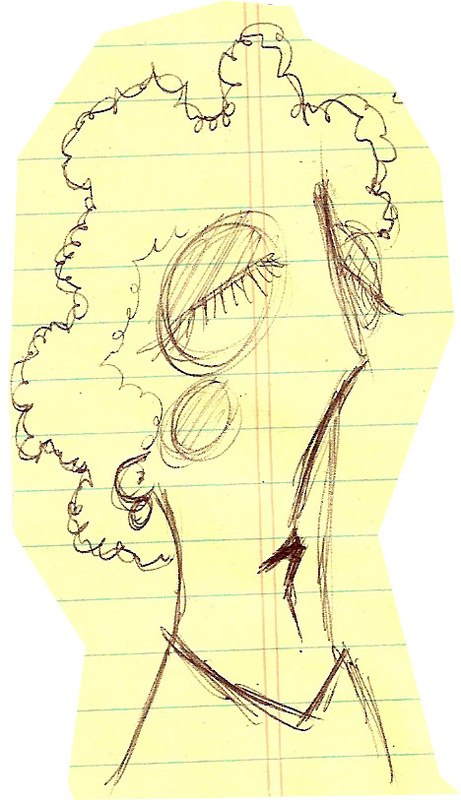 And for more zany doodles of deceiving quality, check out Bryan's site. It's a treasure trove of ink that will move your inner chipmunk in ways you'd never imagined. Quicktime 7 files on my operating system. Thanks to Abe for that one. So all you old school OS users, you can use QT 7 files. And Quicktime 7 is really, really cool. H.264 codec. Mmmmmm. Tasty. 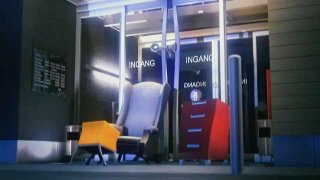 Brecht Debaene sent me a link to a commercial that he recently completed at his job. Brecht works as an animator/TD at commercial shop Hoaxland in Belgium. Take a moment to check it out- it's very fun and well done. It has a great cartoon energy to it. The cool part is that Brecht's only 19 years old! 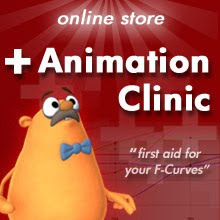 This is his first job as an animator. If he's this solid at his first job... dang! Brecht has been a subscriber to my VTS ever since it started last March. Seeing him do well makes me smile. It's neat to see folks get their break. Anyhow, congrats, Brecht! Here's to many years of happy animating in your future.